▲The box-type design offers a ultra-wide base structure, high quality MEEHANITE® casting iron, oversized hardened, and ground boxed ways to ensure the best machining performance by eliminating structural distortion and deformation under heavy machining conditions. ▲The revolutionary base design separates chip and coolant from the base structure. Thus, it minimizes thermal distortion of machine base caused by high temperature of chips and coolant. The GT series also includes a standard chip conveyor that can be installed either from the rear or side of the machine depending on your factory layout. ▲The tailstock is supported by hardened and ground boxed ways that is structurally on-piece with the machine base, which ensures the best structural rigidity. ▲The oversized quill supports heavy work pieces while maintaining machining accuracy. The GT series is ideal for high productivity turning and milling with exceptional speed, power, and capacity. ▲Oversized hardened and ground box ways, ballscrew, and bearings are essential requirements for enhancing the axial and radial cutting rigidity. ▲High torque spindle motor provides the necessary power for roughing operation on tough material at low spindle speed. ▲High quality chuck with powerful hydraulic system ensures machining rigidity and accuracy. ▲Pressure sensors are added to hydraulic system for monitoring clamping force of chunk, assuring the proper clamping of heavy parts. ▲All spindles are strictly assembled in temperature controlled room, and proven through rigorous run-in test to assure highest quality and reliable. ▲The unique quill-type spindle cartridge is designed for easy maintenance and repair if necessary. ▲Oversized dual roller spindle bearings are used in both the front and the rear of the spindle to provide optimal spindle rigidity that is capable of handling 10mm cutting depth on hard material. ▲The spindle headstock is symmetrically designed with radial configuration for the best heat reduction. ▲Reinforced ventilation is located throughout the spindle head to minimize thermal growth. ▲Effective exhaust fans are installed on the spindle headstock to remove the heat generated from long running hours. ▲High performance piston pump and radiation system are added to control the temperature of hydraulic oil, which minimizes the thermal impact of hydraulic system. ▲Isolated coolant tanks eliminate the effect of high coolant temperature after long running hours, which reduces structural deformation. ▲The spindle motor sits outside of the machine base to isolate the heat generated from spindle motor after long operations. ▲Low heat generated work lamp is installed to minimize temperature impact. ▲The rigid one-piece MEEHANITE® casting iron absorbs the turning vibration and ensures job accuracy. ▲X, Z axes guideways are well hardened and ground with Turcite-B to reduce the friction and offer utmost rigidity in cutting. The rapid feeds is 15m/min. of the X-axis and 20m/min. on the Z-axis. ▲This machine is equipped with high precision ball screws and connected with the motor directly. The fixing design supports both ends; the design of pre-loaded ball screws provides high rigidity, high precision, and low heat effect. ▲The 12-station turret index is done by absolute detection to reduce tool selection mistake. ▲The powerful turret with large diameter curvic coupling offers high precision and high rigidity in cutting performance. ▲The spindle is equipped with high precision angular ball bearing and NN series bearing that provides high precision and rigidity working condition. The inner diameter of the bearing is ø120mm and ø88mm of the spindle through hole. ø78mm of the drawbar through hole adapts large diameter bar stock jobs. ▲The powerful spindle with built-in gears provides various speed transmissions. The maximum torque reaches 74.5kg-m, with 4,000rpm maximum spindle speed. ▲Using “M” code commands the quill stroke of the programmable tail stock, can be hooked with a hydraulic hook to the saddle carriage and slide along the Z-axis stroke. ▲Hydraulic gauges, control values of chuck and tail stock, and the central lubrication system are installed at the front side; for easy use and maintenance. ▲The complete enclosure safely guards the operator, conforms current environmental safety regulations. ▲The machine with auto-lubrication design ensures the accuracy throughout its life time. The slide ways of X, Z axes and ball screws are lubricated. Built-in alarm will occur when the lubrication oil is insufficient. ▲The built-in spindle design alleviates vibration generated by traditional belt-driven spindle design. ▲The spindle utilizes a hybrid spindle design combining high quality angular contact bearings and highly rigid roller type bearings to handle high precision turning and heavy duty machining. ▲The built-in spindle is continuously cooled through inverter type spindle cooling system at a constant temperature, which reduces thermal growth effect. ▲The hydraulic clamping cylinder is cooled through continuous heat removal, which greatly reduces thermal growth and assures turning and machining accuracy and stability. ▲The radial type turret offers larger turning and milling capacity with less tool interference. ▲The turret is servo-driven to achieve the fastest tool changing time from station to station. 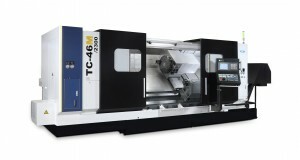 ▲Two types of tooling system are offered to the customers, BMT65 and VDI40. ▲BMT65 tooling system is secured with 4 bolts to maximize cutting rigidity; VDI tooling system offers quick change capability. ▲The oversized box type guideways are treated through induction hardening process and precision ground to achieve optimal rigidity, accuracy, and longevity. ▲The high damping MEEHANITE® casting base is constructed through FEM analysis to obtain optimal structural rigidity. ▲The solid slant-bed design is reinforced through base connection, which reduces deformation and twisting of machine body. The Y-axis capability provides true milling capabilities that cannot be achieved through the traditional turning centers. The NT series allows 100±50mm travel that is sufficient for most mill/turn applications.